I’m saddened by the overcooked insipid slop passed off as cauliflower cheese in many a canteen. Cooking cauliflower is a bit like cooking pasta. It has to be al dente or it turns to an unpleasant mush with that all too familiar whiff of rotten eggs that emanates from overcooked brassicas – I’m thinking cabbage, brussel sprouts, and broccoli here. Its blandness doesn’t rank it amongst my favourite vegetables, though I do like it raw in salads and the nutty flavour that roasting imparts. 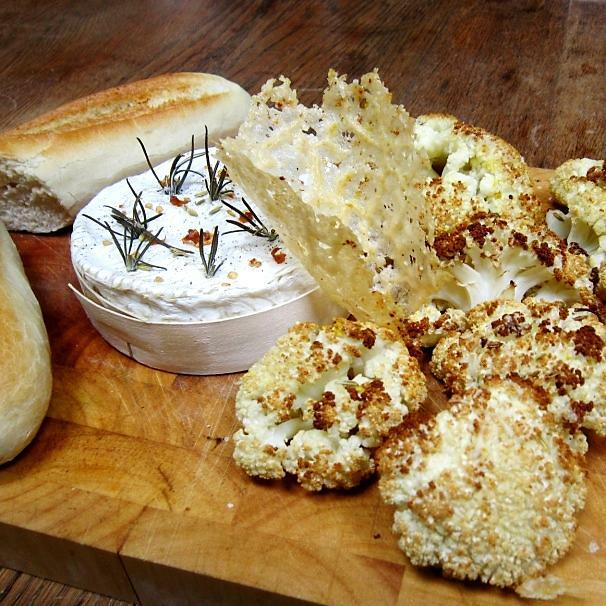 The grocer was selling some lovely looking local caulis and I had a ripe Camembert calling out to be eaten, so I hit upon the idea of a posh cauliflower cheese – roasting the florets and then dipping them into a baked Camembert ‘fondue’. Oh, and why not throw in a parmesan crisp! 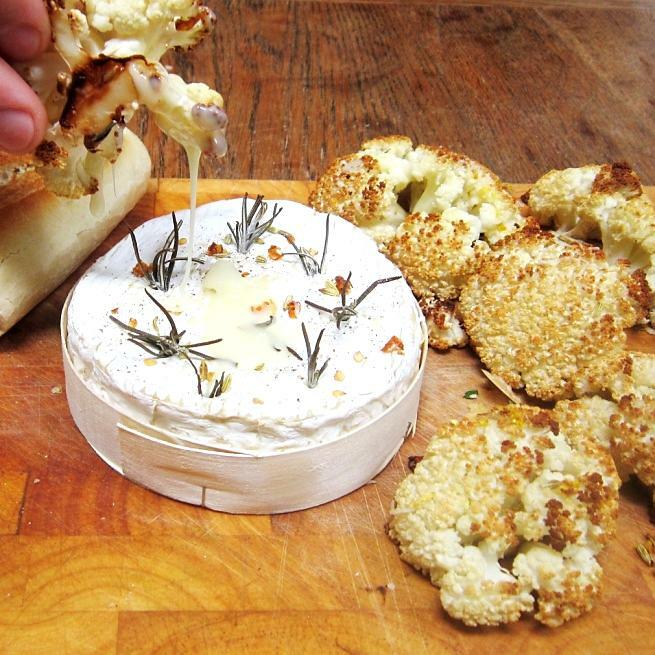 Oven-roasting the cauliflower concentrates the flavour and imparts a lovely nutty toasted flavour, which is perfect for dipping into the molten innards of rosemary infused Camembert Yum! And the best thing is that it is so easy to make. For you cauliflower haters out there – dare you give it a go? METHOD:Spread the cauliflower florets out in an oven tray and sprinkle with the fennel seeds, dried chilli flakes and olive oil. Season and roast in a hot oven at 200˚C for 10 minutes. Spear the rosemary sprigs (you could use thyme if you prefer) into the Camembert and sprinkle over a couple more fennel seeds and chilli flakes. Turn over the florets for an even roast and pop the Camembert in. Bake for another ten minutes, until the cheese is melted – the rind should ‘give’ when you press it gently and the florets are caramelised. Grate over a bit of lemon zest and squeeze over a dash of juice. Grate a tablespoon of parmesan onto a baking sheet or piece of greaseproof paper and press down into a thin layer. Bake for a minute in the oven, keeping an eye on it, and removing it when the cheese has melted and it is tinged brown. Leave to cool for a couple of minutes before peeling off the sheet. 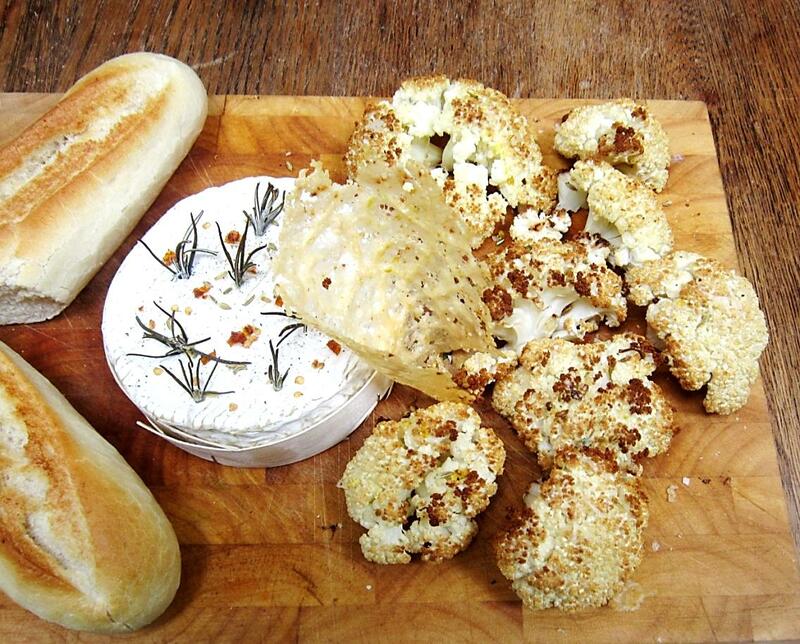 Serve with crusty bread, get dipping and enjoy!